The Design Museum, now in Kensington, currently has an exhibition called Ferrari: Under the Skin, all about the brand and most importantly – their cars. So when my Dad suggest a trip to London to see it, I didn’t take much convincing – especially as he’d planned it to coincide with Porsche night at the Ace Cafe! The journey to the Design Museum took in car (Porsche of course), tube and bus. Whenever I’m in London I’m reminded how lucky I am to live in Coventry, walking/cycling distance from most places I need to go – getting round London is a faff. A very slow faff. I was impressed that I could travel on the tube and bus, just by waving my iPhone at the machine though. The Design Museum’s new location is impressive in itself and much bigger than the old site near the Tower of London, that I visited with Jen in 2015, for their bike exhibition. We were on a tight schedule, so unfortunately only had time to look at the Ferrari exhibition. The first few sections were about Enzo Ferrari and the background to the formation and early years of his most famous racing team. I particularly liked the original design drawings from the 1950’s. I work with automotive CAD at work, so seeing similar drawings done by hand was very impressive. 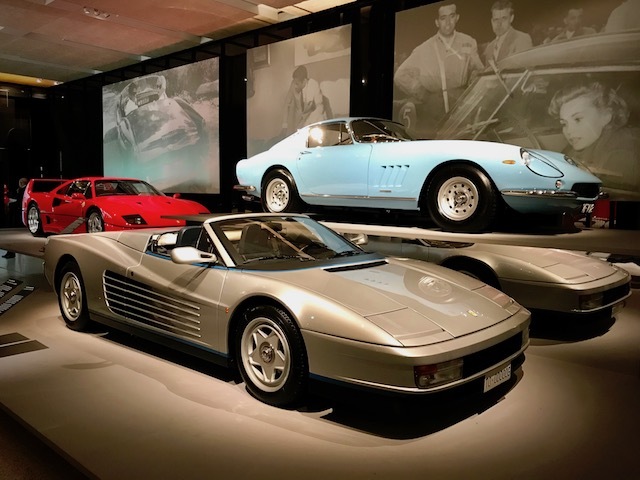 The next section – about the design/construction of Ferraris, as an automotive geek I was in heaven. There were wooden, wireframe and clay styling bucks from over the years, a rolling chassis from a 250 GT and various bits of engines, paired up as rough castings and finished parts. I love seeing how cars are put together! The rest of the exhibition was cars, first road cars, including the gorgeous 275 GTB4 (the blue one in the photo), which was my favourite. Then race cars, on a large banking, starting with the Ferrari 500 F2, which Alberto Ascari drove to victory at the F1 championships in 1952 and 1953 to the Ferrari F1-2000 driven by Michael Schumacher, which also won a world championship. The F1 cars were impressive, but I liked how close to the road cars the GT cars were, including one which Stirling Moss won the Tourist Trophy at Goodwood, whilst listening to the race commentary on the radio! The final part of the exhibition was “the future” and the star car was a white LaFerrari Aperta – one of only 200, this one owned by chef Gordon Ramsay. The car that made me smile the most though, and grab my phone to get a photo, was the little Fiat 500 driving up Kensington High Street, at rush hour, in the rain. I love seeing classic cars being used, but after having driven one I had even more respect for the driver – it was difficult enough to drive on empty country roads, London rush hour in a Fiat 500 would be way too stressful for me! Unfortunately we had to leave before it got really busy, we had a long drive ahead and my Mum was babysitting Owen whilst Dad and I were out looking at nice cars. I can’t wait until we can bring Owen along on our automotive adventures! This entry was posted in Cars and tagged Design Museum, Ferrari, iPhone, London, Photo by Lewis. Bookmark the permalink.